(Excerpt)…”You may find yourself in a place of extreme pain and derision. Perhaps, you don’t have the natural strength to move forward due to all the stress from a situation. Maybe you’re contemplating all the months ahead and wondering how on earth you are going to make it. Perhaps, you don’t have the physical strength to even move forward from all the stress you are experiencing. Do you find yourself in a desert wondering how you are going to provide for your small kids, make the house payments, go to work and function with excellence, to just getting out of bed? You are the very one God wants to speak to right now and take you to the place of totally depending upon Him and trusting Him with your every need. God wants to open your eyes to His well of provision just like Hagar saw in the middle of her desert. God not only wants you to have provision but He wants you to be in peace. He tells us in His Word, “You will keep in perfect peace him whose mind is steadfast because he trust in you” (Isaiah 26:3 NIV). As we trust the Lord, pray, and renew our minds, we find that our emotions do not run wild but rather, we have a calm assurance that God will provide in every area as we wait upon Him. That is the most amazing way to live. Not only does God keep us in peace as we keep our mind stayed on Him, but He also provides food. The psalmist tells us, “I have never seen the righteous forsaken or their children begging for bread” (Psalm 37:25). The LORD can move on someone’s heart to bring you a meal to providing for you in some manner you least likely expect. Several months ago, I remember I was at an appointment and the doctor was running late. I had a lunch appointment and knew I was not going to have time so I called and cancelled lunch. I also knew if I didn’t get a little something to eat that I would have a headache. I remember thinking I would just drive over to the bagel shop and get a toasted bagel for a snack. Just in front of the door, a lady dressed in a warm-up suit asked me if I had some change. I told her I would get some inside. I walked inside and the Holy Spirit spoke to my heart to ask her to join me and buy her lunch. I walked back outside and asked her so we both proceeded through the door together. We began to have casual conversation in line and I asked her what she would like, so we ordered and I paid for it. We sat down and I prayed over our meal and then she began to tell me that she was homeless due to several bad choices. She expressed that she had a good job but lost it due to falling back into some sin and not getting to work on time. I asked her if she had a relationship with Jesus and she said she had heard about him. We ended up praying again and I shared how God had rearranged my day to meet her. I gave her money for a bus, for food, and for a hotel for the night. She told me she stayed off Sugar Creek Road somewhere. I felt compassion for her and her situation. On my drive home, the Holy Spirit spoke to my heart to go and get a pedicure. Now I can guess that some of you might be thinking, “Why would God tell her to get a pedicure?” God sometimes gives us strange instructions, interrupts our days, and positions us to hear from Him specifically. God knows I rarely watch TV news. So listen to this. While getting the pedicure, I heard a man on the news that was on in the nail salon and tentatively listened to every word. He shared how he had been homeless himself, how the churches in the area were coming together, God had given him a ministry, and that a shelter to house the homeless was opening off Sugar Creek the next day. This was the area the lady stayed near. God was letting me know that He positioned me to take care of the lady I met for the day, and He would provide the rest. God never ceases to amaze me. Now, you may not be homeless, but in your heart, you may feel the same. All alone in this big world! Just as God provided for the lady’s day, He is providing for you. I don’t know all the details, but HE does. God provides for our needs because He says so in His Word. The apostle Paul says, “My God will meet all your needs according to his riches in Christ Jesus.” I believe Him. Jesus told His followers not to worry about what they would eat or drink or wear, but to seek His kingdom first and His righteousness, and then all other things would fall into place (Matthew 6:33). A LEAP OF FAITH (25 Days At The Mercy Seat)…the miraculous account of God raising my husband from death, healing him from two strokes and two open-heart surgeries. 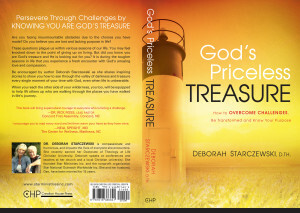 This book will keep you turning the pages and give you faith to believe God for yourself.